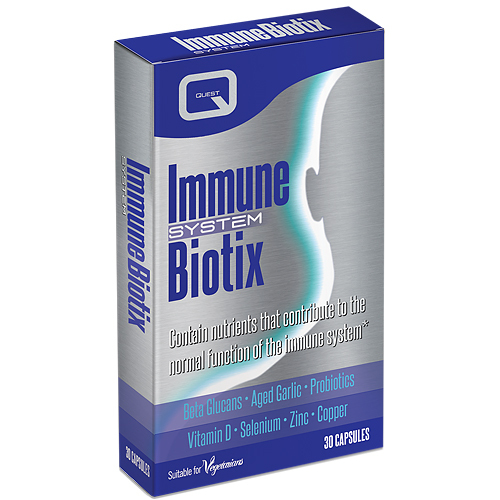 Quest Immune System Biotix is an exciting new formula from Quest. It is a unique combination of nutrients that contribute to the normal function of the immune system. This high potency formula includes beta glucans from yeast, aged garlic, vitamin D, the minerals; selenium, zinc and copper along with probiotic bacteria. Beta Glucans are potent biologically active molecules found in the cell walls of oats, fungi or yeast. Immune System Biotix contains the most active form of beta glucans with both beta (1-3) and (1-6) linkages. Aged garlic extract, which is contained in this product, has been shown to support various immune factors. Vitamin D, selenium, zinc and copper each play a role in the normal functioning of the immune system. Each capsule of Immune System Biotix contains 1000iu of vitamin D.
Synergistic combination of immune supporting nutrients, beta glucans, aged garlic and probiotic bacteria. Vitamin D, Selenium, Zinc and Copper contribute to the normal function of the immune system. Contains the most active form of beta glucans with both beta (1-3) and (1-6) linkages. 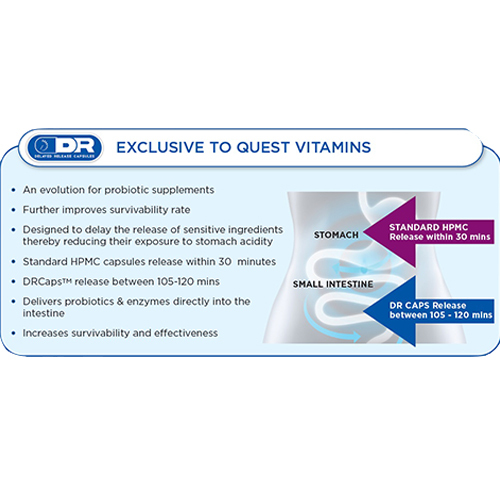 Each capsule provides 1000iu of vitamin D.
High potency multi strain lactobacilli culture providing 20 billion viable probiotic organisms. Providing 20 billion (20 x 109): L.plantarum, L.bulgaricus, L.rhamnous, L.casei. Beta 1-3, 1-6 glucans (from yeast cell wall concentrate), aged garlic extract, mineral amino acid blend (providing zinc oxide, sodium selenite and copper sulphate pentahydrate complexed with citric acid, glycine, hydrolysed rice protein), lactobacilli culture, bulking agent: microcrystalline cellulose, vitamin D3 (with Arabic gum, antioxidant d-a-tocopherol (from soya), tri-calcium phosphate), magnesium stearate, capsule shell (hypromellose). Take one to two capsules daily with or after a meal. Swallow with water. Do not exceed the stated dosage unless directed by a qualified health professional. Store below 25 degrees Celsius. Below are reviews of Immune System Biotix - Probiotic - 30 Capsules by bodykind customers. If you have tried this product we'd love to hear what you think so please leave a review. have not had one cold this year, i have in the past had swine flu & neumonia, and lst year was in hospital with severe chest infection, so to go a winter with no colds amazing!!!!!!!! Quest Immune System Biotix is an exciting new formula from Quest. It is a unique combination of nutrients that contribute to the normal function of the immune system. This high potency formula includes beta glucans, aged garlic and vitamin D.